This version of Roasted Red Pepper Soup was designed for my son and daughter. I can’t even taste it because white potato is one of the food items to which I have an extreme intolerance. 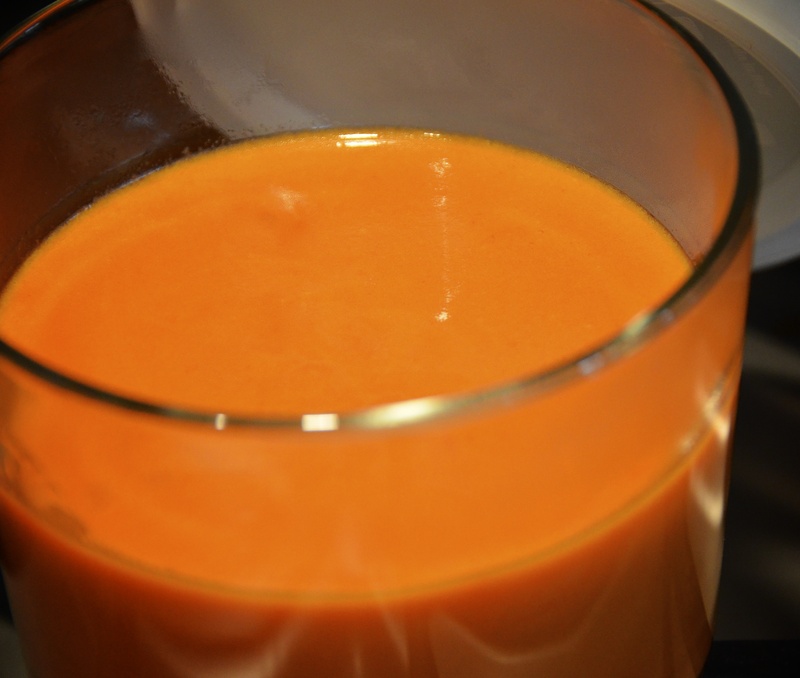 Over the years I had come across a Roasted Red Pepper soup at the grocery store that came in a Tetra-Pak, which the kids loved! I loved it too, not because I ate it, but because of the convenience. It was something I could feed them at the last minute and it was a wholesome food that they liked. Until, we did the ALCAT test which identified for us all the foods that we are sensitive to that can be found in mass produced foods; all the spices and oils that we generally turn a blind eye to. So not only would we have to avoid buying this convenience food, but ironically, I also became very intolerant and sensitive to the post-consumer waste I was contributing to because of convenience! 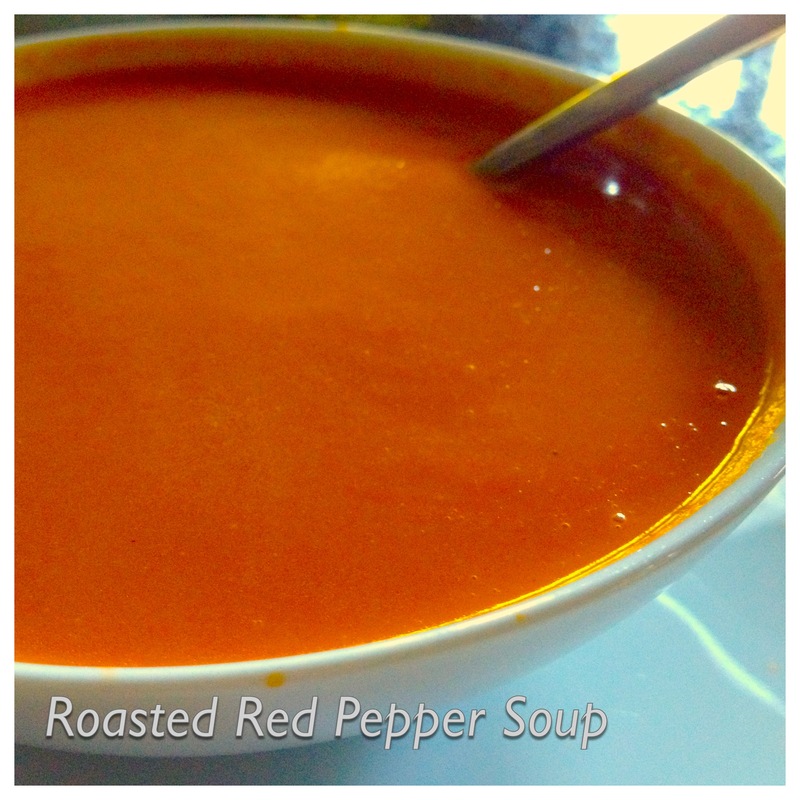 So, I decided that I would come up with my own Roasted Red Pepper Soup that the kids would love just as much. The first batch failed miserably. Amazingly, kids are resilient and were open to tasting my second attempt. This soup got rave reviews and it freezes well too. I batch them into little class freezer food safe containers and can pull them out and reheat them as quickly as I could open a Tetra-Pak. Huge win for all involved. 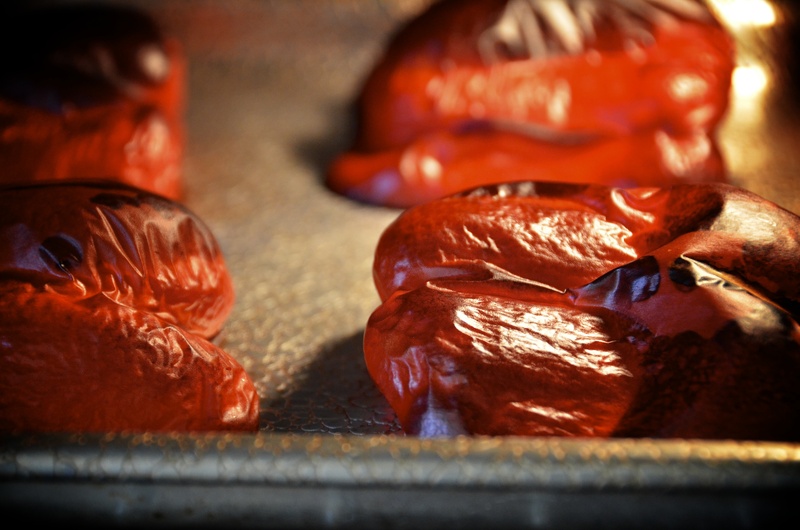 Roast Red Peppers in a pre-heated oven. I start at 350°F and after about 30 minutes I lower the heat to about 275°F until the skins on the peppers start to pull away from the flesh. You can see this in the above photo. It can take up to 45 minutes or longer to get the right amount of roasting. You have to experiment for yourself. While the peppers are roasting, prepare other ingredients. Once peppers have been removed from oven and cooled, remove skins and discard. Some people put their peppers in a brown paper bag to facilitate the peeling, but I don’t do that. Add onions, and allow to soften, not brown. 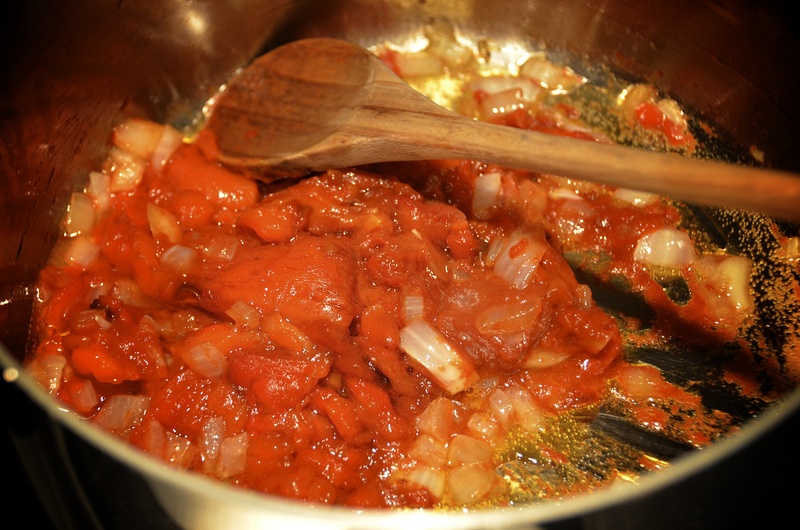 Add roasted red peppers, tomato paste, garlic and fresh diced potato if using. (If using potato flour DO NOT add it yet, continue reading). Stir to combine and let flavours mix for 2 minutes. Add 4 Cups chicken stock. Reduce heat to simmer, cover with a tight fitting lid. Add Potato flour to melted butter and stir to form a paste. Set aside. After soup has finished cooking, purée with an immersion blender. (If you are using a stand up blender, wait until the soup has cooled completely before). It is dangerous to attempt to purée hot liquids. Once the soup has reached the desired smooth soup consistency, return to pot (re-heat if necessary) then add the potato-butter paste. You may want to do a quick purée again after this step. (Blender people may want to add the potato-butter paste in step at step 14. 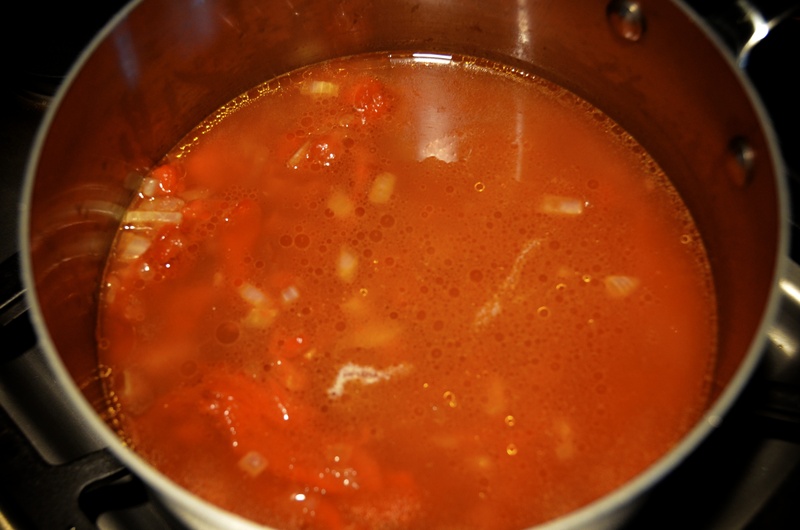 If your soup is too thick, add more liquid (water is fine). Add salt and cayenne pepper to taste. (I didn’t. I let the kids taste the soup and add a little salt for themselves if it needs it. One kid likes spicy and the other not so much, this way everyone is content! ).